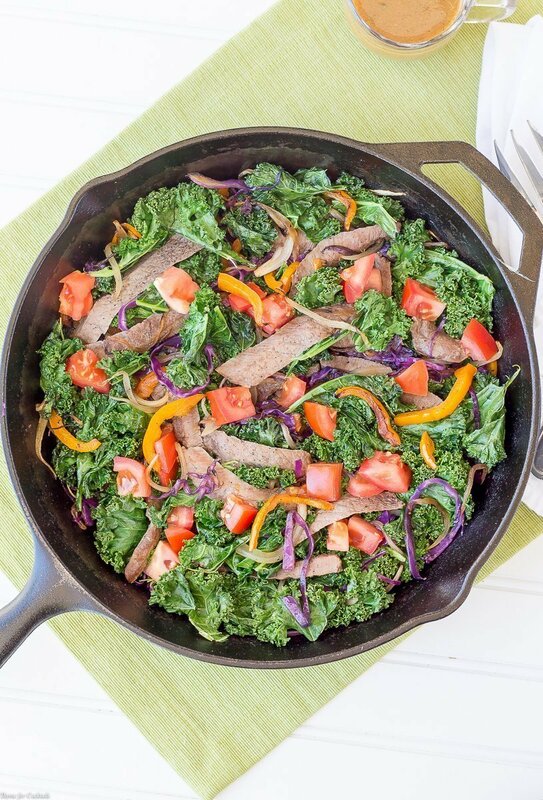 This hearty, nutrient-dense Steak Fajita Kale Skillet Salad is full of savory grilled flavors and bold textures. Serve warm with a drizzle of Ancho Chile Vinaigrette, fresh tomatoes and a squeeze of lime. When I was in the trauma unit after the accident last week, they did a mess of blood work and discovered I am extremely anemic. 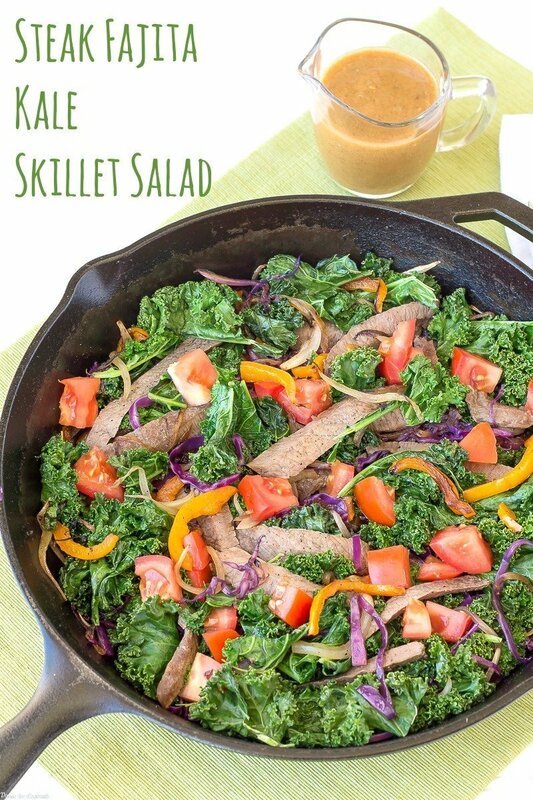 In fact the attending said my hemoglobin levels were ‘shockingly low.’ [bctt tweet=”Steak Fajita Kale Skillet Salad #steak #grilled #salad” username=”thyme4cocktails”] So in addition to taking daily supplements I am adding more natural nutrient sources into my diet with recipes like this Steak Fajita Kale Skillet Salad. 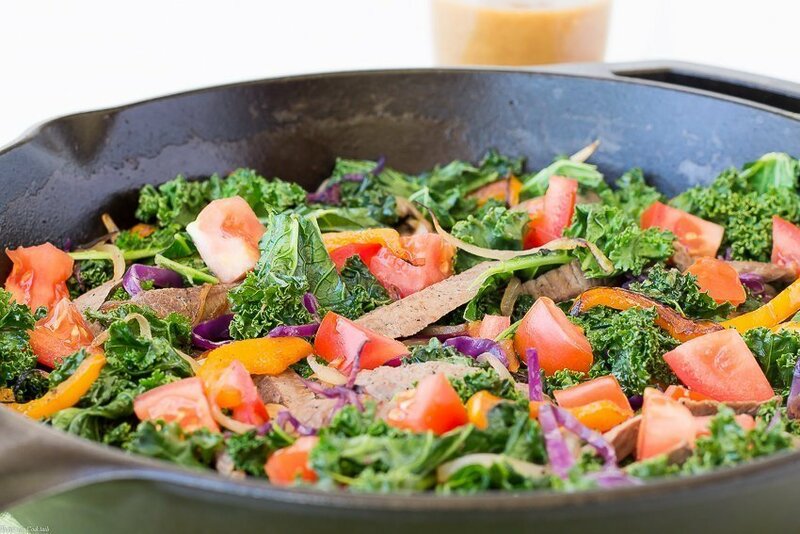 The beef adds a healthy dose of iron, while the kale adds all kinds of wonderful antioxidant-loving goodness including Vitamin C which helps your body absorb iron! 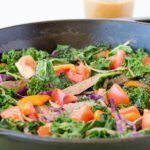 This hearty, nutrient-dense Steak Fajita Kale Skillet Salad is full of savory grilled flavors and bold textures. Served warm with a drizzle of Ancho Chile Vinaigrette, fresh tomatoes and a squeeze of lime. Heat a large lightly oiled cast iron skillet over medium high heat. Add to skillet, sear 2-3 minutes on each side. Remove, set aside on a plate to rest. Add onion and pepper strips to skillet. Cook 5-6 minutes, tossing occasionally with tongs. Remove and set aside with steak. Add 1-2 tablespoons oil to skillet. Add kale and cabbage, squeeze half of lime over greens. Grill 3-4 minutes until slightly wilted and charred, stirring frequently. Place greens in a large bowl. Top with steak and grilled vegetables. Drizzle with desired amount of Ancho Chile Vinaigrette, toss to combine thoroughly. Top with chopped tomatoes, a squeeze of lime juice and serve warm. What a perfect summer salad. Combines the freshness of the salad with the summer grilling of the steak. Thanks Peter! My husband was a little skeptical at first but he loved it! 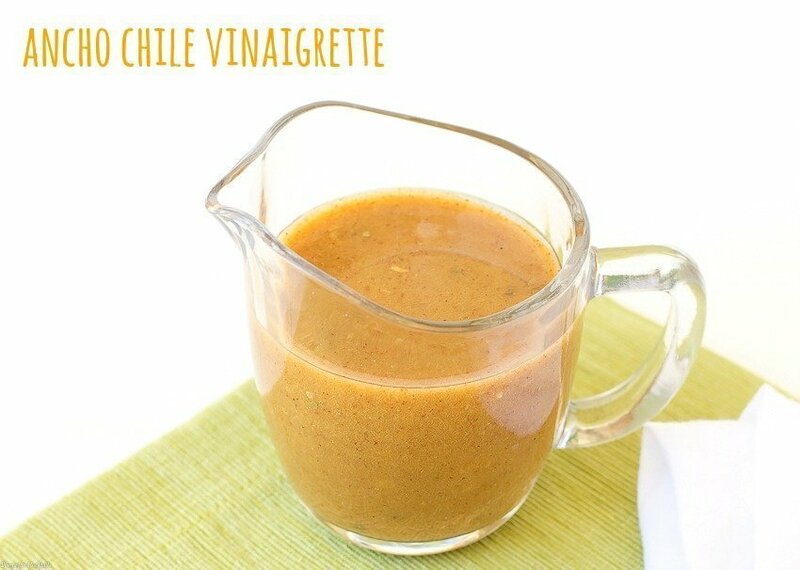 Especially the Ancho Chile Vinaigrette.